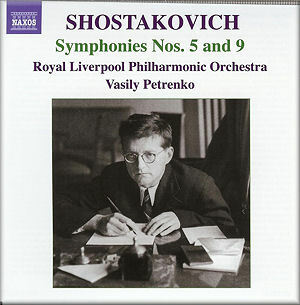 Most of those who bought Petrenko’s Liverpool Shostakovich 11 will want this disc too. They’ll be right, it’s a magnificent achievement and, at the price, an outstanding bargain. Two things strike the unprepared listener when hearing this performance of the Ninth for the first time. The first is the remarkable unanimity of the playing, by which I don’t only mean the ensemble, which is disciplined and tight, but also the sense of unanimity of purpose, a group of musicians playing together in the same spirit and with the same goal. They really listen to each other, and are clearly convinced and motivated by their conductor’s vision and methods. The second is the remarkable quality of the solo playing, so important in this work whose very sound is dominated by the woodwind. I found myself wondering at the sheer bravery of principals in an orchestra. How would you like to be the RLPO’s first clarinet, for example, the night before this recording, thinking about the minute-long solo, barely accompanied by a few pizzicato strings, preserved for posterity by an unforgiving microphone? Or the first bassoonist, allocated about the same amount of time to fill our hearts with Russian gloom whilst sitting in an art deco hall in Liverpool? Well, this has always been a fine orchestra, but a number of initiatives in recent years, not least the appointment in 2006 of Vasily Petrenko as Principal Conductor has transformed it into one of world class. You won’t hear cleaner playing than that of the opening of the Ninth, nor more brilliantly unanimous driving rhythms than those of the absurdly brief third movement. The symphony, short and brisk, disappointed the authorities who were expecting an imposing work to complete the trilogy begun with the seventh and eighth symphonies. It is apparently an optimistic work, rather carefree, but if Shostakovich ever penned a single unequivocal bar of music I don’t know where to find it, and this symphony is certainly as enigmatic as the others, with its real meaning perhaps even better hidden than most. Whether we would think as much of it were it not part of this particular composer’s canon is another matter. Had it come from the pen of Kabalevsky or Khachaturian I think we might have dismissed it as something inconsequential. I’m very attached to Bernstein’s 1965 New York performance, similarly coupled (Sony, Bernstein Century Series), and wonder if he was not well advised, surprisingly for him, to avoid Petrenko’s extremes of tempo for the second and third movements. Then there are other performances from the Russian greats of an older generation which perhaps sound more authentic. But I think the next time I want to listen to the Ninth it will be Petrenko and his Liverpool ensemble that I will take down from the shelves. The disembodied tone of the first violins in the sixth bar of the Fifth Symphony immediately announce another distinguished performance. It is left to the piano, staccato, to introduce the faster, central section of this first movement, and it is in this passage that we first encounter a characteristic of this performance, which is a certain excitability, with a tendency to slightly self-conscious tempo changes. The closing pages of the movement are as desolate as one will hear anywhere, though. The woodwinds are brilliantly perky in the scherzo, and the orchestra’s leader, unnamed, is outstandingly good in the short violin solo. I miss some bite from the horns here, as I also do in the faster section of the first movement, but only because I’m thinking of the Vienna Philharmonic horn section for Jansons on EMI, as hollow and menacing as you are ever likely to hear. The individual strands of the string writing in the opening paragraph of the slow movement are analytically clear, allowing us to savour the sometimes unnoticed piquancy of the harmony, and this attention to harmonic detail is also a feature of the performance as a whole. The flute and harp passage at figure 79 in the score [3:02] is beautifully done, but this ends with an indication to hold back and then immediately return to the basic pulse. Here, however, Petrenko launches the following section at a tempo significantly slower, and though this is undeniably expressive and powerful, I wonder if the performance doesn’t feature a little too much of this kind of freedom in the face of what is marked in the score. There are many examples of this, as there are of places where he encourages his players, wind soloists in particular, to rhythmic freedom at the ends of phrases, expressiveness which can sometimes seem pasted on rather than growing naturally out of the musical material. The climax of the movement is excellent, as is that of the first movement, though the superb Liverpool orchestra cannot yet muster the sheer power of the finest European or Russian ensembles. The often ethereal pianissimo playing, on the other hand, is outstanding. The finale is brilliantly played, but the most controversial feature of this performance is likely to be Petrenko’s way with the closing pages, dogged and defiant rather than victorious, as is the way nowadays, but slower and heavier than I think I have ever heard them. This would be sensational in a live performance, particularly since the ensemble sustains the heavy pulse valiantly right up to the final chord, but whether one really wants to hear this passage so drawn out every time is another matter. To sum up, this is a fine performance of the Fifth and one not to be missed. Petrenko’s is quite an individual view, and a challenging one which demands to be heard, even if listeners may not be in sympathy with every aspect of it. Speaking personally, I find others more convincing. The old Previn performance with the London Symphony Orchestra is still very impressive, but sounds lightweight and conciliatory now that we are used to the post-Volkov reading of the symphony. I also very much admire Mariss Jansons’ reading, but I would urge all admirers of this composer, and this symphony in particular, to seek out Maxim Shostakovich’s live performance with the Prague Symphony Orchestra from 1976 (Supraphon). He takes his time over the work just as Petrenko does, and is just as uncompromising, but without the slight trace of excess that, in my view, slightly mars this new reading.